To raise awareness and participation of the media industry in understanding the diverse cultures represented by the UNITY alliance members. To increase representation of people of color at all levels in the nation’s newsrooms. To increase and broaden news coverage focusing on people of color, and to dispel racial and ethnic stereotypes and myths. To become recognized as the principal national alliance of journalism professionals advocating for diversity and multiculturalism in the news media. To create a self-sustaining organization with a diversified financial base that complements, and does not compete with alliance partners. 1) How Green is Your Beat? Journalists of Color and Environmental Reporting, sponsored by Toyota Motor Sales, U.S.A. 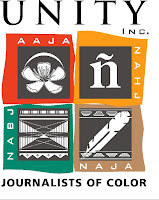 UNITY, representing more than 10,000 journalists of color, is comprised of four national associations: Asian American Journalists Association, National Association of Black Journalists, National Association of Hispanic Journalists, and the Native American Journalists Association. In addition to planning the largest regular gathering of journalists in the nation, UNITY develops programs and institutional relationships that promote its mission. For more on information on UNITY '08 call (703) 854-3585.